"You Can Be Amazing" is a distillation of Ursula James' many years in private practice. The programme developed within this book gives you everything you need to stop tricking yourself, and to start living the best possible life you can - starting from the moment you finish reading. The book, and companion CD, takes you through everything you need to know and do to change your life. Be careful what you wish for... with the help of this book you might just get it. I would recommend this book to anyone who would like to tackle a part of their life they are unhappy with. It is both supportive and motivational, with good examples, guidance and helpful insight. 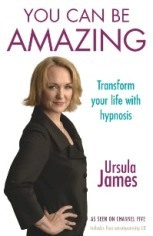 Ursula James' "You Can be Amazing" has changed my life... and I believe I am!" This book comes with a free CD.